A1A from Vilano to Mickler is an increasingly congested, high–speed corridor which has seen a steady increase in vehicle traffic over the past several years. It is the only road connecting over a dozen communities located along this roadway, and is home to more than 5000 residents, seven county parks, Guana River State Park, and numerous businesses. Despite bicycle lanes, the corridor is not conducive to the safe use by pedestrians, recreational cyclists and children, and other non–motorized users. A Multi–Use Trail on the west side of A1A in the existing right–of–way way will enhance the livability and safety of our community. For more information, including a list of frequently-asked questions, or to arrange a presentation to your group, go to: http://www.vilanobeachfl.com/a1a-multi-use-trail. We, the undersigned, support the concept of Multi–Use Trail on the west side of A1A from Vilano Beach Town Center to Mickler Road. We request that St. Johns County conduct an engineering feasibility study as the first step in moving this proposal to reality. 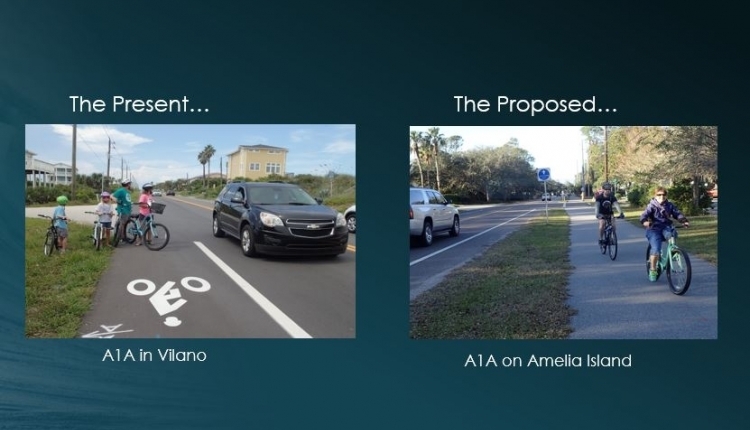 The A1A Multi–Use Trail Vilano to Mickler petition to St. Johns County Board of County Commissioners was written by Mark Atkins and is in the category Roads & Transport at GoPetition.